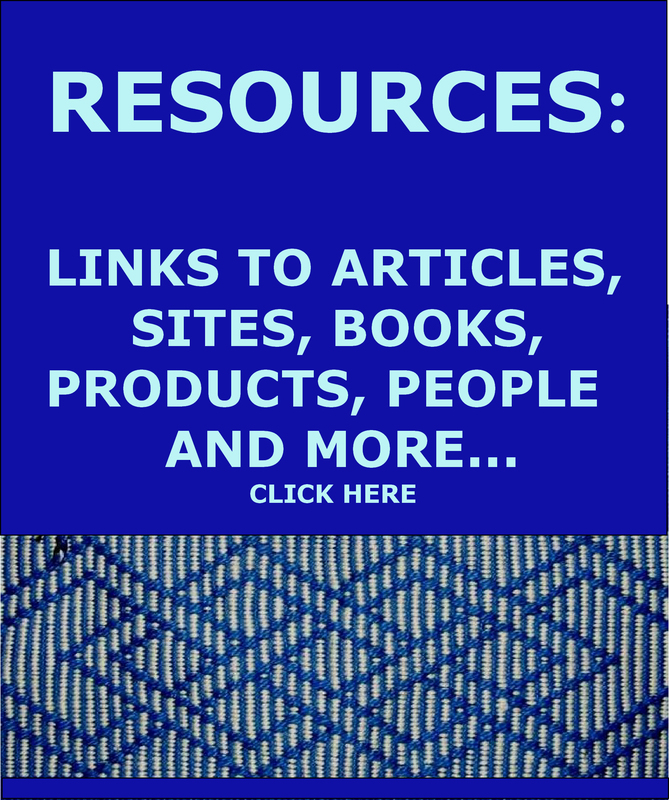 I suggest you follow the beginner tutorial on supplementary weft patterning here before attempting this second more advanced one. This tutorial was first presented over two weeks within blog posts so there are two parts. I have extracted the information from the two blog posts for this tutorial page. 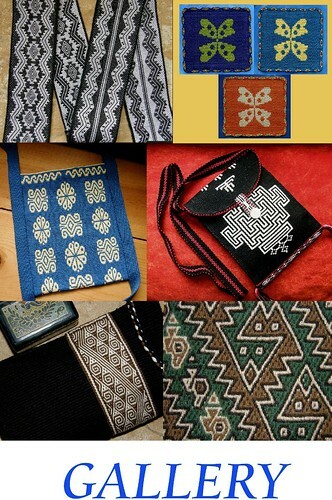 It shows the kind of supplementary weft patterning that I learned in one particular town in Guatemala. I wove a tree design at left using the various warp wrapping and inlay techniques that my Guatemalan teacher employs and this was fun as I hadn’t done any of this since 2008 immmediately after my return from my first visit there. I learned these techniques with my teacher Martine and her daughter Carmen in Santa Catarina Palopo on the shores of Lake Atitlan. I met Martine in Panajachel where she sells textiles in the street market. She took me to her home and spent one morning setting up the loom and then her daughter took over weaving and teaching me for the next week or so. She was a good teacher. 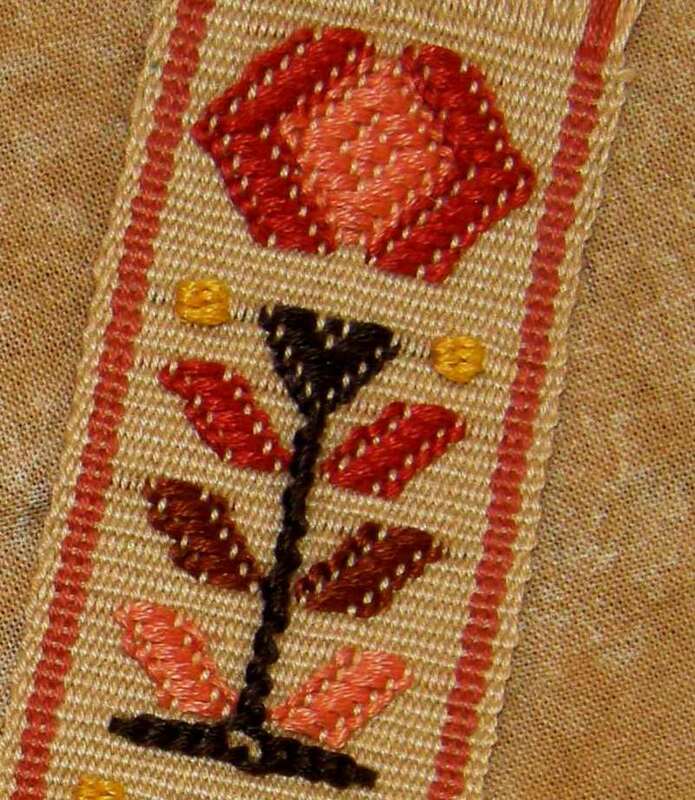 Each motif was repeated six or seven times across the cloth. Carmen would show me five times what to do and then would let me weave the last one or two motifs to practice what she had shown. The weavers set up their looms with great care. Martine was obviously more skilled at doing this and Carmen only took over when everything was set to go. The warp is wound with two crosses. The second cross helps hold the shed rod in place. 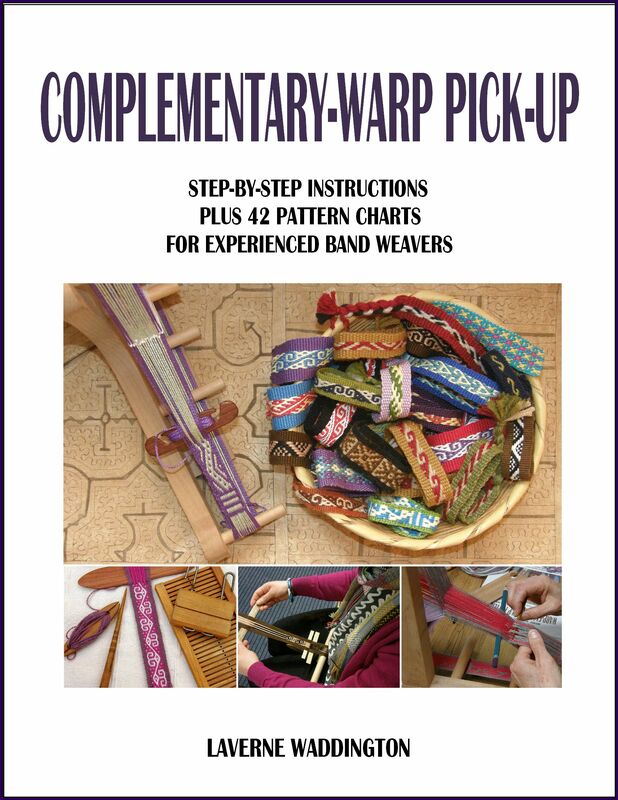 In the first part of this tutorial you will see a series of step-by-step pictures showing how the warp is prepared for this kind of supplementary weft patterning. A plain-weave ground cloth is woven onto which the supplementary weft motifs are woven. Certain warps are raised in each shed under which the supplementary wefts are passed. 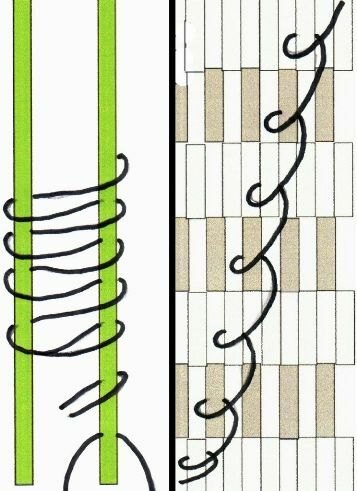 As the same warps for the supplementary weft patterning are raised every time, they can easily be picked and stored on pattern sticks so that the weaver does not have to continually pick them up by hand for every weft pass. In the above picture you can see four passes of yellow supplementary wefts under the warps which form the two pattern sheds.. All the motifs that my teachers showed me were created by passing supplementary wefts under the warps in these pattern sheds. Two pattern sticks are used. One stick is inserted under the selected pattern warps in the shed-rod shed and another holds the selected pattern warps in the heddle shed. I show the process of picking and inserting the pattern sticks first in step-by-step pictures and then in a video. LEFT: This is the basic loom set-up with shed rod and string hedddles in place. RIGHT: An extra stick is placed in the second cross to hold the shed rod in position. In order to create the patterns, two extra patterning sticks need to be inserted. These are stored up beyond the shed rod. One is stored on top of the warp and the other underneath. LEFT: To set up the patterning sticks, the shed rod shed is opened and the first set of patterning warps are picked up. Pick one, drop two, pick one, drop two across the width of the warp.. NOTE: I am using doubled threads so what looks like two threads in the photos actually counts as one thread.The weavers use a pointed stick to do this. 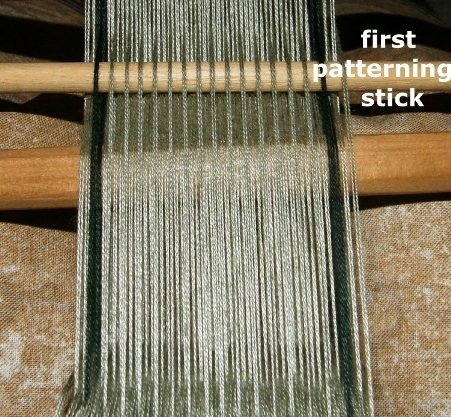 RIGHT: The pointed stick is inserted under all the picked warps and then pushed up toward the heddles. This will raise the picked up warps on the other side of the heddles. Another stick is then placed under the warps on the other side of the heddles. This is the first patterning stick. The first patterning stick sits up beyond the shed rod until called into use. LEFT: A colored weft is placed under the warps in the first patterning shed. This serves as a reference to make picking up the warps for the second patterning shed easier. RIGHT: The heddle shed is opened and the warps in the second patterning shed are picked up. Between each warp in the first patterning shed, there are three warps. You need to pick up the middle one of these three warps. You will pick one, drop two, pick one, drop two all the way across the warp. The pointed stick is inserted under all the picked up warps. The pattern stick for these warps will be stored UNDER the warp and a special maneuver is required in order to do this…see the next set of pictures. 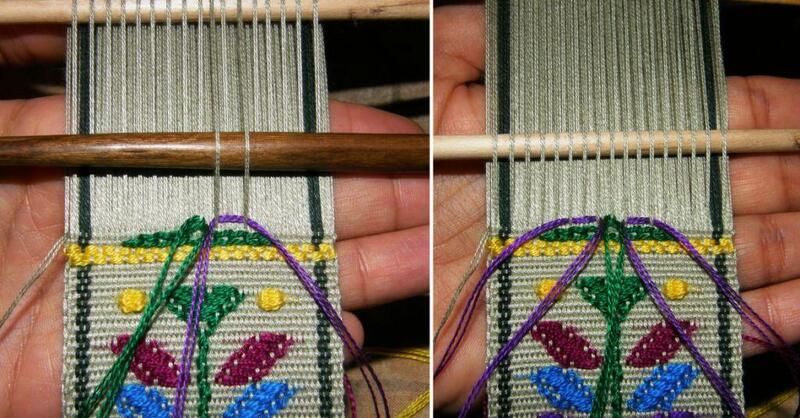 LEFT: The pointed stick is moved up toward the heddles which will raise the picked up warps on the other side of the heddles. 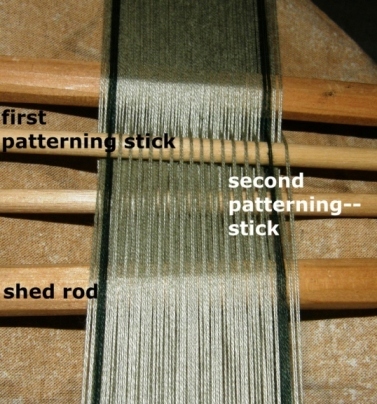 RIGHT: A stick is placed under the raised warps on the other side of the heddles. Then both the stick and the shed rod are raised in order to create a new shed underneath the two. In the picture I have my hand within this shed and will replace it with the second patterning stick. Here you can see the two patterning sticks in place up beyond the shed rod…one on top of the warp and another underneath. Now the warp has been prepared with its two patterning sticks ready to create patterns with supplementary wefts. Watch the process again in the following video. I am using very thick yarn and only a few warps in the video just to demonstrate the basic process. The video is in two parts. The second part of the video shows how to use the pattern sticks to raise the warps and lay in weft for some basic patterning. This is also explained in the photos below. I am using thick warp and weft in the video just so everything is easy to see. The photos show the types of yarn that should be used for this technique. 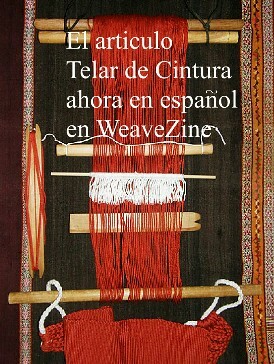 Two wefts are used to weave the above typical patterns of Santa Catarina Palopo: a red weft is passed through the two main sheds (shed rod shed and heddle shed) to weave the ground weave and the brightly colored supplementary wefts are passed under or wrapped around the patterning warps to form the motifs. These are samples that I wove when I returned from Guatemala. Motifs are usually started and ended with four rows of supplementary wefts in the patterning sheds forming the yellow brick-like design shown above. 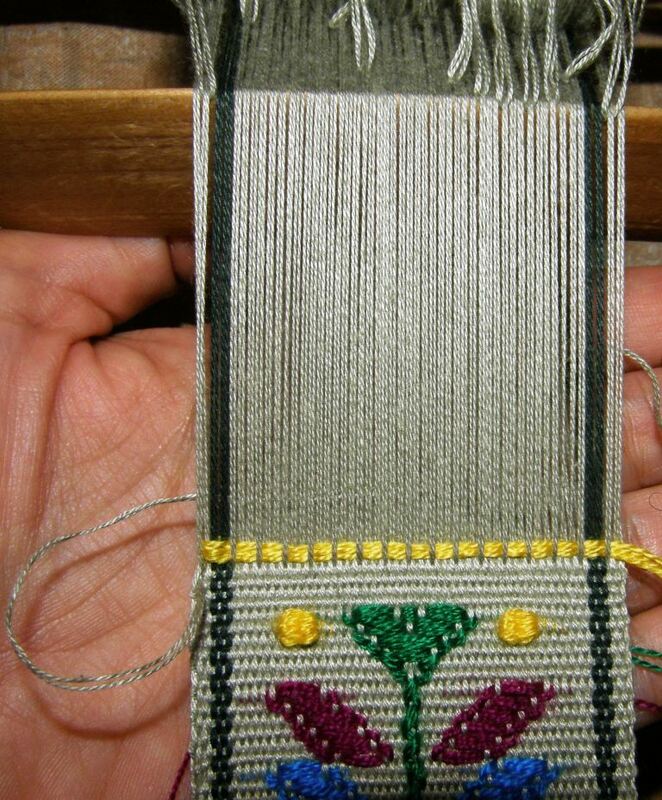 The colored pattern weft (in this case yellow) is passed through the pattern shed and then the main weft (in this case light green) is passed through the main shed. In this picture I have laid in the first pass of yellow supplementary weft. 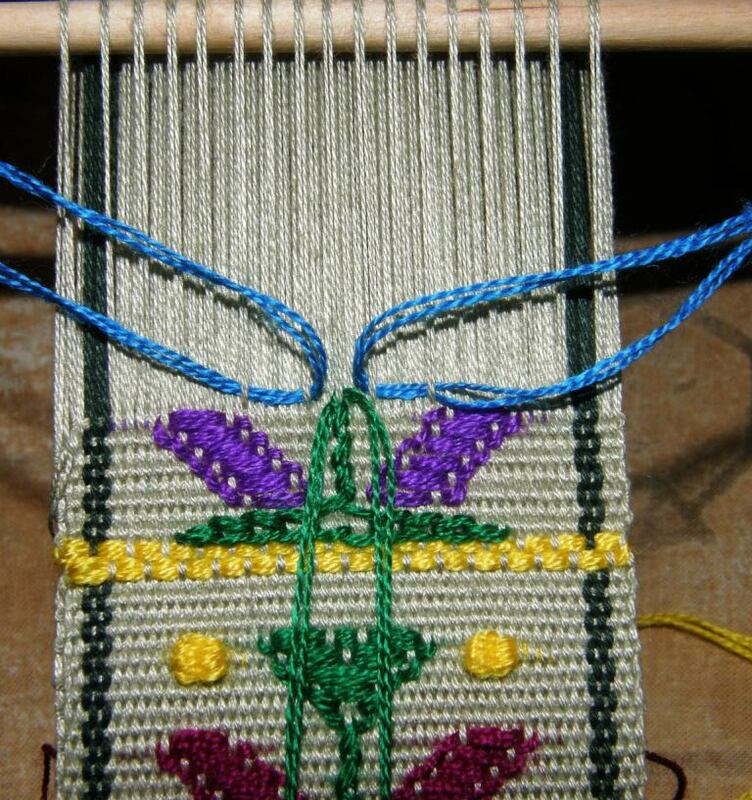 Four rows of yellow weft are usually woven before starting a new motif. 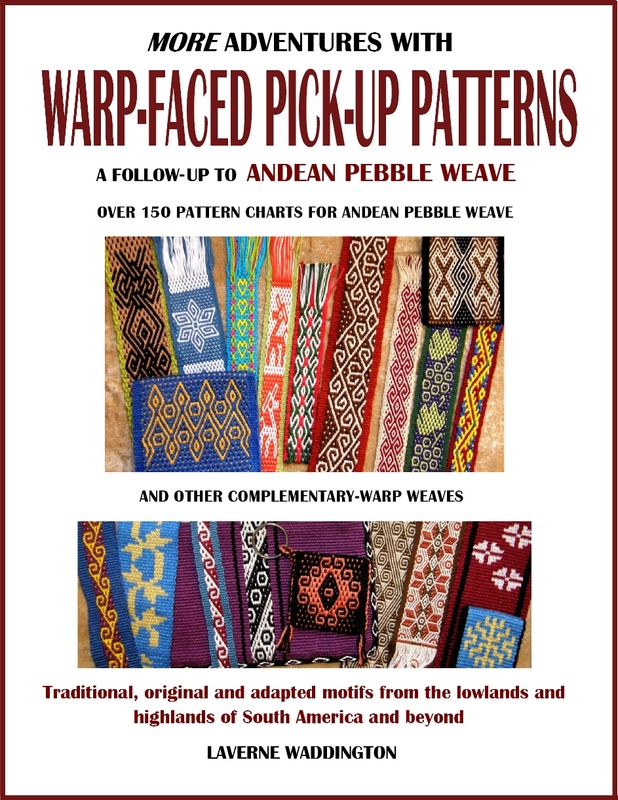 Here concludes Part One of this tutorial on Guatemalan single face supplementary weft patterning. So far we have looked at how to pick the two patterning sheds and store them on sticks up beyond the shed rod, how to open the patterning sheds and how to weave the basic brick design which separates the motifs on a piece. We also looked at the weaving sequence, that is, first passing the supplementary weft and then the main weft. In Part Two, I will show you how to create the outlines of shapes by wrapping the supplementary weft around warps and fill them in by laying in supplementary wefts. The Guatemalan weavers create all kinds of bird, plant and human figures. This is a fun technique with little or no counting involved which allows you to play freely with shapes and colors. The resulting weaving looks like a piece of embroidered cloth except that the “stitches” only appear on one side of the fabric. Last week when I started the tutorial on this technique, I was using acrylic threads that I had brought back from Guatemala to create bright mutlicolored trees on a green background, pictured at left. I decided to buy some embroidery floss to work with and it took some time to get just the right thickness to go with my chosen ground weave warp. The ground weave is a 50 wpi cotton and I used 4 strands of embroidery floss to do the patterning. (one piece of embroidery floss has 6 strands so you need to remove 2). The 50 wpi warp produces a wonderfully thin cloth just right for bookmarks although the pattern wefts do add some bulk. So, let’s continue with the tutorial. All the colored wefts that form the patterns pass under or wrap around the warps in the two patterning sheds. This green piece has 86 ends between the dark green border stripes. 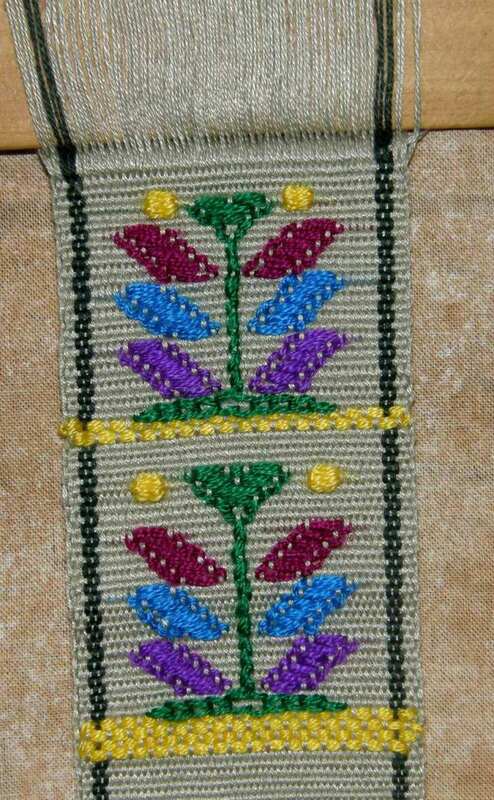 we will start with the horizontal line that forms the base of the tree motif. The base of the little Guatemalan tree is a double horizontal line. 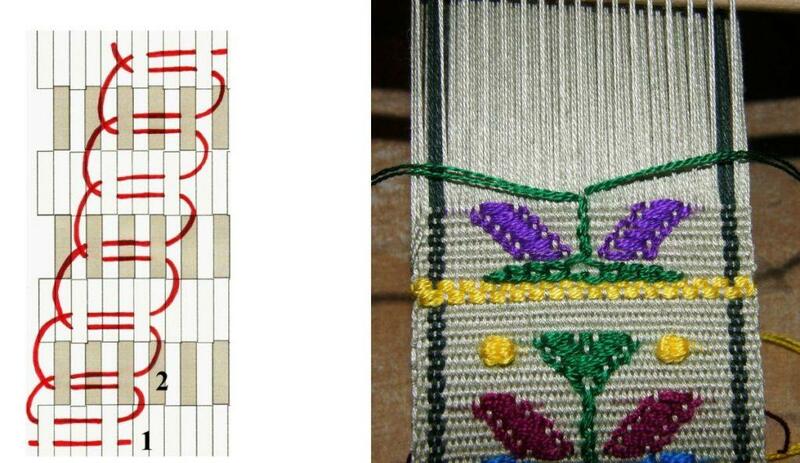 STEP ONE: To form this horizontal line, place a strand of around 40cm/16″ of supplementary weft under the central patterning warp. The two ends on either side should be of equal length. The central warp in my set- up just happens to be in patterning shed 2 so I have started in the heddle shed. STEP TWO: Cross the ends of the supplementary weft as shown. STEP THREE: Start wrapping the left hand end around the 5 warps to the left of the central warp and return wrapping around 4 warps. The diagram below shows how this is done. The steps for horizontal wrapping are shown here. 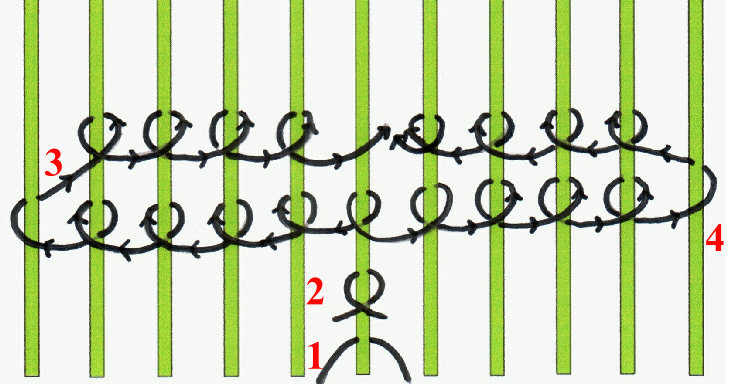 The left end of the weft wraps to the left and returns and then in STEP 4, the right end wraps to the right and returns. These four steps all take place in the same pattern shed. The wefts wrap around four warps on their return journey to the center. STEP 5: Pass the main weft through the complete shed. This completes the base of the tree. Now I am ready to start creating the stem….a vertical line. Open the next shed, which is, in my case, the shed rod shed and pass the main weft. Open the heddle shed and raise the patterning warps in patterning shed 2. Patterning shed 2 contains my central warp. Every time I raise the warps in patterning shed 2, I will wrap my green tree base weft around the central warp to form a stem. The drawing at left shows the very simple vertical wrapping method. The stem, therefore, is woven only in every second shed. In this shed I will also lay in the wefts to form the first pair of leaves. 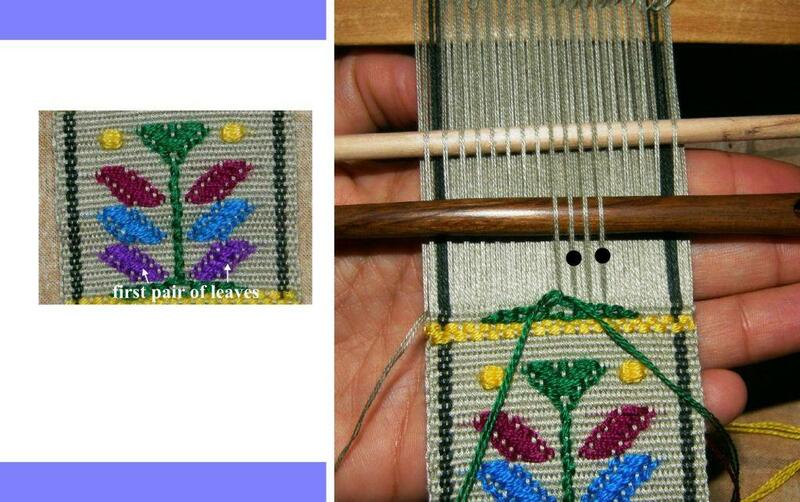 Cut two lengths of weft around 24cm/9 1/2” long for the two leaves. Thelittle Guatemalan tree has three pairs of leaves and the stem continues growing until it eventually widens out into the tree top. Once you have woven your six leaves, I am sure that it will be very easy for you to see how the tree top is formed. 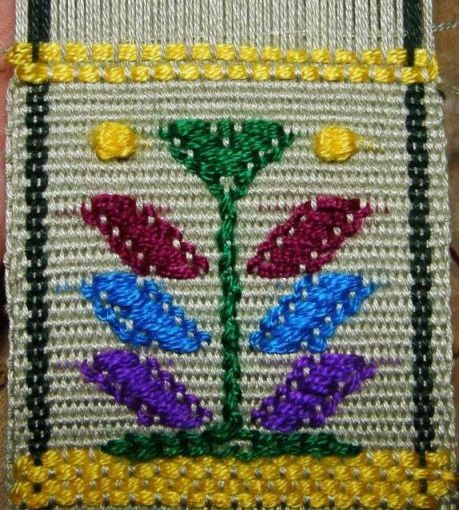 You are weaving your stem with two strands of weft – one will start traveling to the right and one to the left while filling in the tree top in the same way that you filled in the leaves. 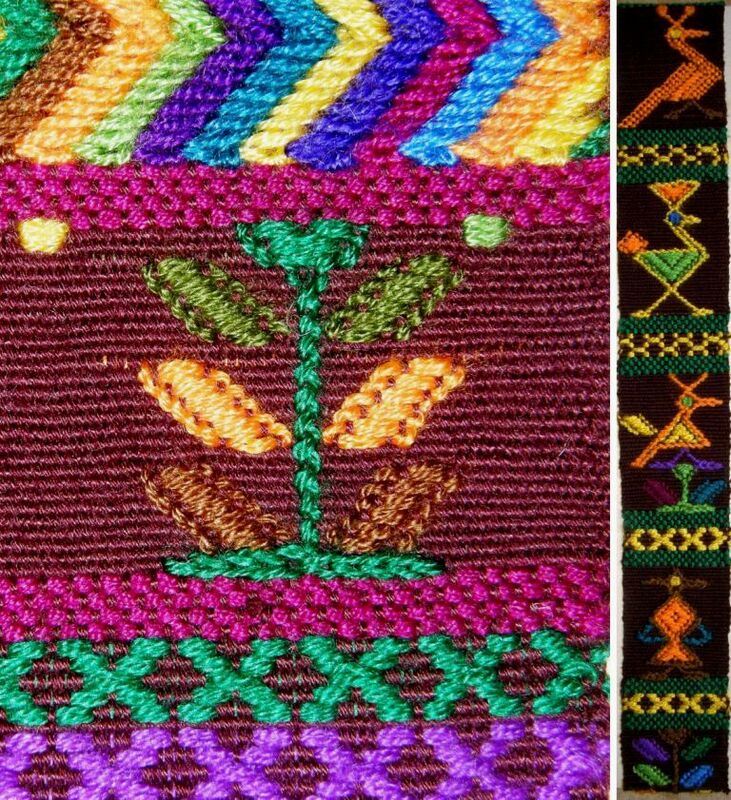 Finally there are the little spots that the Guatemalan weavers like to use to fill in blank spaces between motifs. I used them in my bookmarks as flower buds. You can see two yellow spots in the photo above. To make a spot, you use two adjacent patterning warps as shown in the drawing above left. Use a strand of weft half the thickness that you would normally use. Around 12cm/5″ length should be plenty. First pass the weft behind the warp on the right as shown. Then join the two ends together and go wrapping them back and forth in the same shed about six times. Pass the ends through the main shed and out the back of the weaving. The drawing above right shows how to make a diagonal line for a branch. It is very easy to improvise with this technique. Have fun with it! Here is an other technic to go on !! You are really an ocean !! Thank you !! Thank you. What an amazing technique! 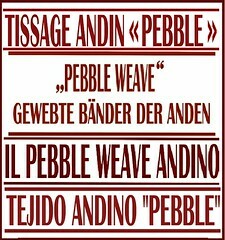 I’m still working on my pebble weave projects, but will definitely try this someday.